As a man whose day is ruined at the slightest onset of stomach pain, I can only begin to imagine how painful periods can be. For many women, periods pains are more than just irritating cramps, those who suffer from dysmenorrhea can experience varying levels of back pain, nausea, diarrhea, and headaches. For many women, I would guess it's pretty close to, if not over, the crying face on the pain chart. So when a guy compares something as simple as scraping a knee to periods, women rightfully get angry. Twitter user @__sargee recently made a similar mistake. The male athlete shared a photo of a soccer player with scraped knees, and wrote: "Until women experience this, I don’t wanna hear about period pains." Unsurprisingly, the guy got a fair deal of criticism for his comments. "So uterus, no opinion," one user wrote. While one female athlete explained how injuries she'd experienced on the field compared to her periods. One Twitter replied to the above comment with a suggestion: "If men think skinned knees hurt that bad they should experience idk something like a skinned internal organ ripped out every single month all the bleeding and cramps and groin pain." Men experience abuse too. But on a world wide scale women are more vulnerable to it. Being sold as cattle, involuntarily married to older men, domestic violence etc. Men do experience abuse. And they are valid. Don’t put words in my mouth. The worst part, though? Twitter user @katmarsch searched for the offending knees on Google and found out that they actually belong to a woman. Well, that's embarrassing. And plenty of people had something to say about it. "I think my favorite thing in these shots is she's like 'grazed my knees but no scars so no big,'" one user wrote. "And he's like WOMEN COULD NEVER." "You do realize that every single match of the 2015 Women's World Cup was played on artificial turf, right?" One Twitter user wrote: "This is.... nothing? Like you think turf burn is bad? Oh my sweet summer child." Perhaps the most fitting slam was the woman who laid it out like it is: " Also, periods feel like being stabbed with a knife in the gut, since one of our organs is literally killing itself for a week as we go into a mild form of labor. But sure. 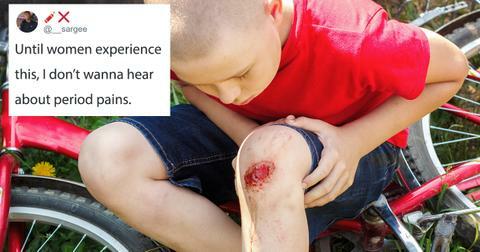 Scraped knees are worse. " He probably won't make that mistake again.